This chemistry dictionary offers the chemistry definitions starting with the letter I. These glossary terms are commonly used in chemistry and chemical engineering. Click the letter below to find the terms and definitions beginning with that letter. where n is the number of moles of the gas and R is the ideal gas constant. Ideal gases are defined as having molecules with negligible size with an average molar kinetic energy is dependent only on temperature. At low temperature, most gases behave closely to ideal gases. where P is pressure, V is volume, n is the number of moles, and T is the absolute temperature. where P is pressure, V is volume, n is the number of moles of an ideal gas, R is the ideal gas constant, and T is the absolute temperature. ile – Ile is an abbreviation for the amino acid isoleucine. Isoleucine is also abbreviated as I.
imidogen – Imidogen is an inorganic radical with chemical formula NH. The imidogen molecule is a hydrogen atom single bonded to a nitrogen atom with an unbound lone electron pair. immiscible – Immiscible is the property where two substances are not capable of combining to form a homogeneous mixture. Example: Oil and water are immiscible liquids. impact factor – The Impact Factor is a measure of the number of citations within scientific journals. The impact factor is used to gauge the relative importance of a scientific journal within its field. Eugene Garfield, the founder of the Institute for Scientific Information (ISI) which is now part of Thomson, is the person who devised the impact factor. Thomson Scientific calculates impact factors annually for the journals it indexes. incandescence – Incandescence is defined as the release of light by a body due to its temperature. The light usually is in the infrared and visible regions of the electromagnetic spectrum. Examples: The glow of molten lava, red-hot frying pan, and glow of the filament in a light bulb are all forms of incandescence. independent variable – An independent variable is a variable that is changed in a scientific experiment. Independent variables are the variables that the experimenter changes to test their dependent variable. Example: A scientist is testing the effect of light and dark on the behavior of moths by turning a light on and off. The independent variable is the amount of light and the moth’s reaction is the dependent variable. indicator – An indicator is a substance that undergoes a distinct observable change when conditions in its solution change. 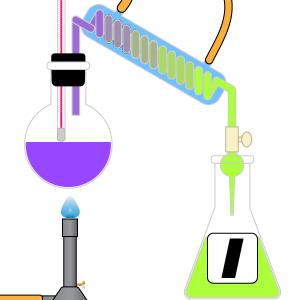 Example: A pH indicator changes color over a narrow range of pH values in solution. indium – Indium is the name for the metal element with atomic number 49 and is represented by the symbol In. inductive effect – The inductive effect is the effect the charge of a chemical bond has on the orientation on the adjacent bonds in a molecule. Electron clouds in a bond tend to orient themselves towards the more electronegative atom involved in the bond. inert pair – Inert pair refers to the electrons of an atom’s outermost s shell electron pair. Inert pairs tend to remain in their orbitals and not be shared with other atoms in a compound. This can be used to explain how atoms such as lead can have common ions of Pb2+ instead of the Pb4+ expected by the octet rule. inflammable – Inflammable is an older term identical to flammable, which is a property of a material relating how easily the material ignites or sustains a combustion reaction. infrared – Infrared refers to the region of the electromagnetic spectrum with wavelengths between 700 nm and 300 μm. Infrared is the region between red in the visible spectrum and microwaves. inhibitor – An inhibitor is a substance that delays, slows or prevents a chemical reaction. initiation – Initiation reactions are a type of reaction where free radicals are formed. These reactions can then trigger or ‘initiate’ one or more secondary reactions. inorganic chemistry – Inorganic chemistry is the study of the chemistry of materials from non-biological origins. Typically, this refers to materials not containing carbon-hydrogen bonds. insecticide – An insecticide is a compound that destroys insect life. Example: Dichloro-diphenyl-trichloroethane or DDT is an insecticide. insoluble – Insoluble is the term used to describe a substance incapable of dissolving in a solvent. It is rare for absolutely no solute to dissolve at all. instantaneous rate – Instantaneous rate is the rate of reaction at a single instant of time. insulator – An insulator is a material that conducts heat, electricity, sound, light, or any other form of radiation poorly or not at all. Most commonly, when a person refers to an insulator, they mean an electrical insulator. Just be aware the term is more general. Many materials insulate against more than one type of energy flow. For example, rubber is a good thermal and electrical insulator. An electrical insulator resists the flow of electrons. Examples: Glass and rubber are electrical insulators. A thermal insulator resists heat flow. Examples: Fiberglass insulation used in homes and wool both heat insulators. A sound insulator resists sonic energy. Keep in mind, sound is different from electromagnetic radiation in that it needs a medium to propagate. A vacuum is a perfect sonic insulator. intensive property – An intensive property is a property of matter that does not change as the amount of matter changes. Examples: Density, specific gravity and specific heat are all intensive properties. intermolecular force – The intermolecular force is the sum of all the forces between two neighboring molecules. internal conversion – Internal conversion is defined as a transition of energy within a molecule or atom from a high energy state to a lower energy state without an accompanying photon. For molecules, the energy change is absorbed into the molecule’s vibrational modes and generates heat. Internal conversion is also a type of radioactive decay where a nucleus in a high metastable state interacts with one of the atom’s inner electrons and causes the atom to eject the electron. Internal conversion electrons are different from beta radiation electrons because they do not involve the conversion of a nucleon and are not accompanied by a neutrino. The lack of neutrino also gives internal conversion electrons discrete energy values. internal energy – Internal energy (U) is the total energy of a closed system. Internal energy is the sum of potential energy of the system and the system’s kinetic energy. The change in internal energy (ΔU) of a reaction is equal to the heat gained or lost (enthalpy change) in a reaction when the reaction is run at constant pressure. intramolecular forces – The intramolecular force is the sum of all the forces holding a molecule or compound together. intrinsic property – An intrinsic property is a property of a substance that is independent of the amount of the substance present. intermediate – An intermediate is a substance formed during a middle step of a chemical reaction between reactants and the desired product. The D chemical would be an intermediate chemical. inverse proportion – Inverse proportion is the relationship between two variables when their product is equal to a constant value. iodination – Iodination is a chemical reaction where an iodine atom is integrated into a molecule. iodine – Iodine is the name for the halogen element with atomic number 53 and is represented by the symbol I.
ion – An ion is an atom or molecule which has gained or lost one or more of its valence electrons, giving it a net positive or negative electrical charge. Examples: alpha particle (He2+), hydroxide OH– are both ions. ion-dipole interaction – Ion-Dipole Interaction is the intermolecular force that occurs when a charged atom or ion approaches a dipole. The ion is attracted to the portion of the dipole molecule with the opposite charge and repelled by the portion of the molecule having the same electrical charge as the ion. This causes the ion to align with the molecule. Example: An example of ion-dipole interaction occurs between the Cl– ion and the water (H2O) molecule, where the negatively charged chlorine atom is attracted to the hydrogen side of a water molecule and repelled by the oxygen side of the molecule. ion exchange – An ion exchange is the passing of ions from one electrolyte to another or from one electrolyte and a coordination complex. Ion exchange is also a technique for separating ions from a solution through reversibly binding the ions to an ion-exchange resin. ionic – Ionic is a term pertaining to something carrying a net electrical charge, as an ionic bond or ionic compound. ionic bond – An ionic bond is a chemical link between two atoms caused by the electrostatic force between oppositely-charged ions in an ionic compound. Example: There is an ionic bond between the sodium and chloride ions in table salt, NaCl. ionic compound – An ionic compound is a compound formed by ions bonding together through electrostatic forces. Example: Table salt, NaCl, is an ionic compound. ionic equation – An ionic equation is a chemical equation where the electrolytes in aqueous solution are written as dissociated ions. ionic radius – The ionic radius is the measure of an atom’s ion in a crystal lattice. Values for ionic radius are difficult to obtain and tend to depend on the method used to measure the size of the ion. A typical value for an ionic radius would be from 30 pm (0.3 Å) to 200 pm (2 Å). Ionic radius may be measured using x-ray crystallography or similar techniques. ionization energy – Ionization energy is the energy required to remove an electron from a gaseous atom or ion. The first or initial ionization energy or Ei of an atom or molecule is the energy required to remove one mole of electrons from one mole of isolated gaseous atoms or ions. You may think of ionization energy as a measure of the difficulty of removing an electron or the strength by which an electron is bound. The higher the ionization energy, the more difficult it is to remove an electron. Therefore, the ionization energy is an indicator of reactivity. ionization potential – Ionization potential is another term for ionization energy. See definition above. ipso – Ipso is a prefix used in organic chemistry nomenclature. It is used to when two substituents share the same ring position of an intermediate compound. iridium – Iridium is the name for the transition metal element with atomic number 77 and is represented by the symbol Ir. irritant – An irritant is a compound that causes tissue damage and inflammation at the point of contact. iron – Iron is the name for the transition metal element with atomic number 26 and is represented by the symbol Fe. isocyanate – Isocyanate is the name of the -N=C=O functional group. Example: Methyl isocyanate or MIC is an isocyanate common in pesticides. isoelectronic – Isoelectronic refers to two atoms, ions or molecules that have the same electronic structure and the same number of valence electrons. Example: The K+ ion is isoelectronic with the Ca2+ ion. The carbon monoxide molecule (CO) is isoelectronic to nitrogen gas (N2). isolated system – An isolated system is a thermodynamic system that cannot exchange either energy or matter outside the boundaries of the system. An isolated system differs from a closed system by the transfer of energy. Closed systems are only closed to matter, energy can be exchanged across the system’s boundaries. isomer – An isomer is a chemical species with the same number and types of atoms as another chemical species, but possessing different properties. There are structural isomers, geometric isomers, optical isomers, and stereoisomers. Examples: Pentane, 2-methylbutane, and 2,2-dimethylpropane are structural isomers of each other. They all have the chemical formula C5H12, but have different structures and properties from each other. isomeric transition – An isomeric transition is a form of radioactive decay where a gamma photon is emitted by a nucleus in an excited metastable state. The photon is emitted when the energy of the excited nucleus drops to the lower, ground state. Isomeric transition does not alter the components of the parent nucleus, it only lowers the energy level. Isomeric transition decay is denoted by the abbreviation: IT. isomerization process – Isomerization is a process by which straight chain hydrocarbons are converted into branched chain hydrocarbons. This process is typically used in the production of gasoline. isotactic polymer – Isotactic polymers are polymers where all the substituents are attached to the same side of the backbone polymer chain. isotonic – Isotonic refers to a solution with the same osmotic pressure of another solution. isotopes – An isotope is an element with differing numbers of neutrons in its nucleus. Example: Carbon-12 and Carbon-14 are both isotopes of carbon. Both have 6 protons but one has 6 neutrons and the other has 8 neutrons. isotopomer – Isotopomer is a combination of the words isotope and isomer. Molecules that are isotopomers have the same constituent atoms with the same isotopes where the only difference between the compounds is the position of the atoms. Example: Consider propane: CH3(CH2)CH3. If one of the hydrogen atoms were deuterium (D), two possible isotopomers would be CH3(CHD)CH3 and CH3(CH2)CH2D. IUPAC – IUPAC is an acronym for the International Union of Pure and Applied Chemistry. The IUPAC is the recognized authority for chemical standards of nomenclature, measurements, and atomic mass values.